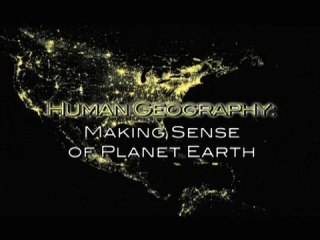 Human Geography: Making Sense of Planet Earth presents human geography’s unique perspective. Human geography focuses on the distribution of places and human traits across the globe and their connection to one another. Presented by acclaimed geographer Alec Murphy this incredible series shot in HD reviews significant discoveries, individuals, and theories that make human geography a cutting edge science in the 21st Century. 00:11:29One of the pioneers in human geography was Carl Sauer, and the human geographical perspective is really what we call the spatial perspective and allows us to educate ourselves on the complexity and interconnectiveness of the global system from landforms to the economy. 00:04:33For geographers there are basically three types of regions - the vernacular region, functional region, and formal region. 00:02:32Human geography's fundamental interests in the places and patterns created by humans on the Earth's surface. Program two focuses on the most fundamental aspect of the human cultural landscape: the distribution and concentration of people across the planet. At the same time it examines how population distribution has changed over time, and why. 00:04:25Population density depends upon factors like topography and climates such as temperate climates. 00:02:56Surplus agriculture is a major reason for population growth and why people conglomerate. 00:03:57U.S. demographer Warren S. Thompson was a pioneer in examining the change in birth and death rates of a country over time as it changed from an agricultural society to a more urbanized and more industrialized society and the resulting population growth with the diffusion of people from place to place. 00:01:32Thomas Robert Malthus and his Malthusian population theory did not account for the 20th century's Green Revolution. 00:03:59Push and pull factors of migration can explain out-migration. 00:02:57The migration of people from one country to another, such as the brain drain from third world countries to the U.S. can also have counterflows that show there is a tendency for population systems to equilibriate over time. 00:00:46The rate of population growth has slowed since the middle of the 20th century but the population still growing toward 10 billion people by 2050. 00:05:04The geopolitical landscape is the study of territory, political power, power, strategic landscapes and authority, and can include such ideas as the old theory of Social Darwinism as it applied to clans and tribes. As the human population has grown to over 7 billion people, nothing has had to change more than the geography of agriculture. Program five studies the primary relationship between people and the cultivation of land and how agriculture has developed to sustain Earth's incredible, ever-growing population. 00:02:17The cultivation of food, the diffusion of seeds and the domestication of animals is part of the transition from hunter-gatherer societies to agricultural ones. Economic growth, wealth creation, outsourcing, economic inequality, resource distribution, and the uneven penetration of the global economy are phenomena that have a strong geographic base. In program 6 Alec Murphy looks at how human geography can make sense of the economic world in the global economy of the 21st Century. 00:02:16Economic diversity across the world, such as a market place in Northern Africa or one in Mumbai India, has led geographers to look at the spatial distribution of economic factors like resource availability, and labor costs and the interplay of these factors in different scales from the global economy to local economies. 00:02:15How economic development is measured and what it means are questions commonly addressed by looking at, GDP, or Gross Domestic Product, and differ from place to place. 00:02:35The development of an urban industrial society in the modern global economy has socio-economic consequences. In 1800 only 3% of the world's population lived in cities. Now in the 21st century more than half of humanity lives in urban areas. Program seven examines where cities are located, how are they organized, and what are they like and how by answering these questions we can begin to understand how to live on a planet of global cities. In the 21st century, the Earth's surface is being reshaped and reorganized on a scale unprecedented at any other time in the planet's history. It is a change directly caused by humans. In program eight Alec Murphy investigates why geographical concepts and insights are critical to the effort to confront the challenges of our ever-changing planet as its population grows to a staggering 10 billion people in the 21st century. 00:04:37Industrialization is a threat biodiversity in biodiversity hotspots such as the Amazon rainforest and can lead to destruction of ecosystems and species extinction in those places. 00:02:02Anthropocene Era or Anthropocene is the modern era of geological time in which humans are a major agent of change in our Earth environment, affecting systems such as the hydrological cycle. 00:02:57The Industrial Revolution marked the beginning of the Anthropocene, changing the distribution of key factors such as wealth and access to resources and creating climate changes and globalization. 00:02:35Economic inequality can be seen in the access to, natural resources, such as oil and gas reserves, and by examining the Gina coefficient.